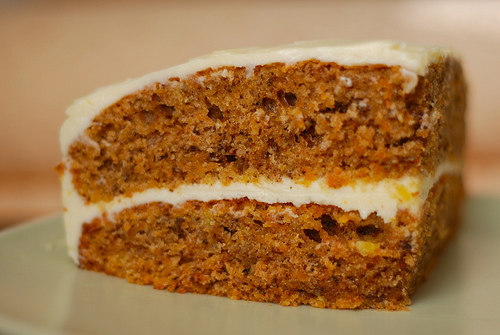 I know, I know….we’ve all made carrot cake. We all love the icing, the delicate spices and nutty flavours. I can’t let go of a carrot cake that we used to sell at a cafe I worked at in high school. I remember the owner’s wife used to make it and it was like nothing else on this planet. I have since tried to recreate that magical moment to no avail. VC’s birthday was last week (Happy Birthday sis!) and we had a family dinner to celebrate on Sunday night. As usual Mum made a beautiful spread and a lovely birthday cake. It was carrot cake this year, and it was divine. So marvelous that I felt I should pop in a link and some kudos on my blog. It is from the Let Her Bake Cake Blog and the recipe is apparently from the Rose Bakery in Paris that people line up for. It is the best one I’ve had since the one at Cafe Q. The icing is somehow better than any icing have made before as well. A note to those who are going to make this beauty, is that it needs a little extra baking time, or a bigger cake pan than suggested. Mum found the middle was raw, even after following all of the rules. So perhaps try pouring less in your cake pan, or baking a little longer (like at least fifteen minutes) and you should be fine.